Explore some of the many creations I have made. Scroll down for the full list or use the filters. Or discover them here. Wall quilt. Juried into the 2008 Canadian Quilters’ Association National Juried show. Size 38 by 29 inches. Wall quilt. Juried into the 2006 Grand National: wildlife. Wall quilt. Juried into the 2006 Grand National:Wildlife. Size: 22 by 28 inches. Wall quilt designed for the 2013 Grand National: Local Colour. Size 55 1/2 by 22 inches. Wall quilt made using Gloria Loughman tiled method. Juried into the 2015 Canadian Quilters’ Association National Juried show. Size 20 by 30 inches. Wall quilt featuring hand painted background and applique. Juried into the 2017 Canadian Quilters’ Association National Juried show. Size 18 by 14 inches. 3-D Thread applique on painted fabric background. Matted and framed. Size 14 by 16 inches. Thread painting on my painted fabric background. Created during my Fredericton Arts Alliance Artist in Residency July 2018. Theme for the residency was the Wolastoq or Saint John river. Matted and framed under glass. Size 18 by 13 inches. Thread painting on painted fabric background. Size 12 by 20 inches. Thread painting on my painted fabric background. Matted and framed under glass. Size 20 by 17 inches. 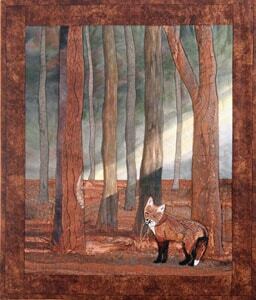 This piece was chosen for Threadworks :2010 Trees and toured Ontario galleries for 3 years. 3-D Thread applique heron on my painted fabric background. Inspired by a photo taken in the spring while entering the trail leading to Curry Mountain Douglas NB. Matted and framed under glass. Size 17 by 15 inches. Wall quilt made for Team Canada in the World Wide Whispers project. Inspired by the wall quilt made by Pat Findlay. I offer several different types of ReCreations that incorporate images of my Creations. I currently offer Bookmarks and All Occasion Cards. Custom commissioning may be available for some images and items. Piece made for the SAQA Atlantic trunk show. Matted and framed under glass. Wall quilt 8 by 10 inches. Accepted into SAQA Atlantic Transitions Show and traveled in NS and NB throughout 2018 and into early 2019. Outfit made to honour time spent with my dad walking in the woods as a child. The leaf buttons were created using polymer clay. My Peaceful Oasis hung at the Grand National Juried Quilt Show at Josef Schneider Haus in Kitchener Ontario from May 7 to September 3, 2017. This cow portrait was commissioned by a neighbour for her granddaughter’s 2017 graduation from veterinary college where she specialized in large animals. She is engaged to a dairy farmer and this is his favourite cow. It is a combination of appliqué and free motion stitching on my painted background. It was framed under glass and by all reports very well received. Wall quilt 34 by 21 1/2 inches Accepted to SAQA Atlantic Transitions show and that traveled in Nova Scotia and New Brunswick throughout 2018 and into early 2019. Chosen for Threadworks 2013: Water. Toured throughout Ontario for 2 1/2 years. Matted and framed under glass, 14 by 18 1/2 inches.